The conference website is up and running! 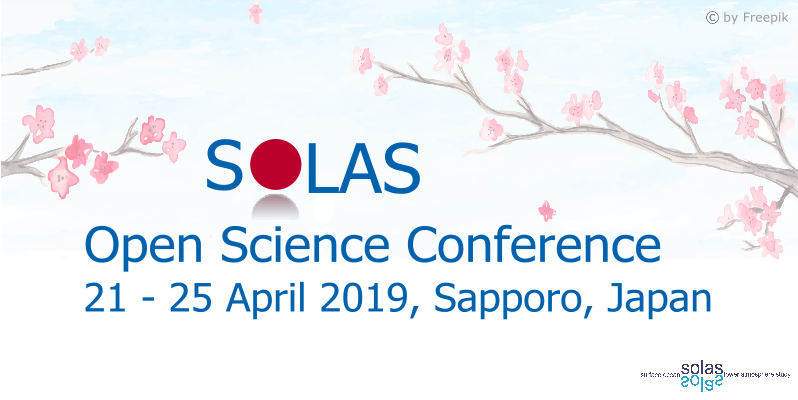 SOLAS welcomes nominations to its International Scientific Steering Committee (SSC) for a term beginning on January 1st 2019. Two members are sought in the following areas of the SOLAS 2015-2025 Science Plan and Organisation. The deadline for applications is 30 April 2018, 12:00 noon, Berlin time. More information here. Congratulations to Jessica Gier, who has been formally appointed SOLAS Executive Director. Jessica first joined the SOLAS International Project Office (IPO) as a Project Officer in April 2017, and has been acting as interim Executive Director since October. This position is funded by the GEOMAR Helmholtz-Centre for Ocean Research Kiel, which has hosted the IPO since 2010. Jessica received her Ph.D. from GEOMAR in benthic nitrogen cycling in oxygen minimum zones, and she is now relishing the opportunity to lead the SOLAS IPO and the program’s activities towards future success. Deadline extended: Ocean Carbon & Biogeochemistry (OCB) is seeking more nominations for Ocean-Atmosphere Interaction Subcommittee, chaired by Rachel Stanley. - Is this nominee willing to serve if elected? Practical training on ocean acidification, 4-22 June 2018, Fiskebäckskil, Switzerland. Submit an application by 13 April 2018. Details here. A Joint AerChemMIP/RFMIP/PDRMIP Workshop in support of CMIP6, 11-15 June 2018, Reading, UK. Submit an abstract by 13 April 2018. Details here. Gordon Research Seminar: Spatial and Temporal Scales of Biological Response in Ocean Global Change Biology, 14-15 July 2018, Waterville Valley, NH, USA. Apply by 14 April 2018 here. Ocean Deoxygenation Conference, 3-7 September 2018, Kiel, Germany. Submit and abstract by 14 April 2018 here. The CNRS Summer School on Active transport in the Ocean: Turbulence, Chemistry & Biology, 2-6 July 2018, Wimereux, France. Submit an application by 15 April 2018. Details here. The joint PALSEA-QUIGS workshop on Climate, Ice Sheets and Sea level during past interglacials, 24-27 September 2018, Galloway, New Jersey, USA. Apply by 15 April 2018. Details here. 2018 Call for SCOR Working Group Proposals. Submit a proposal by 16 April 2018. Details here. Workshop on Fundamentals of Atmospheric Chemistry and Aerosol Modeling, 13-15 August 2018, Boulder, CO, USA. Submit an application by 16 April 2018 here. The 4th GEO BLUE PLANET International Symposium, 4-6 July, Toulouse, France. Submit an abstract by 16 April 2018 here. Call for session proposals for the 2018 AGU Fall Meeting, 10-14 December 2018, Washington, D.C., USA. Submit a proposal by 18 April 2018 here. Call for applications from scientists to serve on PAGES Scientific Steering Committee (SSC) from January 2019. Submit an application by 19 April 2018. Details here. Call for new PAGES working groups. Submit a proposal by 19 April 2018. Details here. Call for nominations for IGAC SSC membership. Submit a nomination by 20 April 2018 here. CLIVAR-FIO Joint Summer School 2018, 25 June-7 July 2018, Qingdao, China. Apply by 20 April 2018. Details here. The 2nd IMBeR Open Science Conference-Ocean sustainability for the benefit of society: Understanding, challenges, and solutions, 17-21 June 2019, Brest, France. Submit a session proposal by 23 April 2018. Details here. DISCO XXVI (Dissertations Symposium in Chemical Oceanography 26), 21-25 October 2018, Hawaii, USA. Apply by 23 April 2018 here. The IV International Conference on El Niño Southern Oscillation: ENSO in a warmer Climate, 16-18 October 2018, Guayaquil, Ecuador. Submit an abstract by 30 April 2018 here. 2018 ESSAS Annual Science Meeting, 12-14 June 2018, Fairbanks, Alaska. Submit an abstract by 30 April 2018 here. The Fourth Xiamen Symposium on Marine Environmental Sciences, 6-9 January 2019, Xiamen, China. Submit a session proposal by 15 May 2018. Details here. The 15th International Circumpolar Remote Sensing Symposium (ICRSS), 10-14 September 2018, Potsdam, Germany. Submit an abstract by 15 May 2018. Details here. TPOS 2020 workshop on Bridging Sustained Observations & Data Assimilation, 1-3 May 2018, Boulder, CO, USA. More information here. 2018 GEWEX Open Science Conference Extremes and Water on the Edge, 6-11 May 2018, Canmore, Alberta, Canada. More information here. Joint GEOTRACES/PAGES Workshop on 'Trace element and isotope proxies in paleoceanography: A synthesis workshop', 3-5 December 2018, Aix-Marseille, France. More information will be available in early 2018 here. A new TOAR paper is available for open comment: Tropospheric Ozone Assessment Report: Tropospheric ozone observations – How well do we know tropospheric ozone changes? View the paper here. CLIVAR and US CLIVAR: A joint special edition on Sea Level Rise. Read the issue here. White paper on Arctic change and possible influence on mid-latitude climate and weather from US CLIVAR. Read the paper here. PAGES workshop and open meeting support. Apply by 19 April 2018. Details here. NSF grant for ICES travel support for YoungScientists with accepted abstracts for the ICES-PICES 4th International Symposium on the Effects of Climate Change on the World's Oceans (Washington, DC, June 4-8). Submit an application by 20 April 2018. More information here. EuroMarine opens two funding calls targeting individuals affiliated with its Member Organisations: Call for Foresight Workshop and Working Group proposals (closing on 31 May 2018, details here), and Call for Applications for Individual Fellowships to participate in advanced courses (closing on 27 April 2018, details here). Bid Solicitation for the 16th IGAC Science Conference in 2020. The deadline for bid submissions is 13 April 2018. More information here. Call for US CLIVAR-sponsored workshops. Apply by 20 April 2018. More information here. Call for papers-Special IIOE-2 Issue Volume 2 DEEP SEA RESEARCH-PART II. Submit a paper by 31 May 2018. Contact here for details. IUGG calls for nominations for the Fellowship Award and the Early Career Scientist Award. Details of the Fellowship Award here, and details of the Early Career Scientist Award here. Frontiers in Marine Science research topic: Spatial and temporal variability of seawater chemistry in coastal ecosystems in the context of global change. Submit a manuscript by 1 July 2018. More information here. ARICE call for ship-time proposals requesting access to PRV Polarstern, CCGS Amundsen and RV Sikuliaq in the Arctic Ocean to carry out ship-based research activities. More information here. Call for external reviewers of the second order draft of the chapters of the IPBES global assessment of biodiversity and ecosystem services. Details here.